The major trunk roads and motorways are generally in good condition, however some of the more rural roads can be very rough and bumpy due to being patched up several times. A Vignette is required for the motorways, major highways and some trunk roads, the cost for is 22€ for a week and 36€ for a month. Category for a motorhome is D2. We bought ours on line at www.tolltickets.com and did have it checked at a services off the motorway. You don’t need to display anything in your windscreen, its all done electronically. Compared to Romania the standard of driving was a dream, drivers showed a lot more patience when overtaking and waited until they could see ahead clearly. Although part of the EU Hungary still has its own currency which is referred to as Forint or Huf. There are around 300 Forint to the Euro so there were lots of zeros to deal with here. Somehow it always makes the cost of living seem more expensive but in reality that wasn’t really the case, although it was noticeably more than Romania or Bulgaria. There are lots of ATM’s and money exchanges are available in tourist destinations. Banks will NOT change money here. Large supermarkets and fuel stations in major towns all take cards, elsewhere its best to carry cash. Some fuel stations also sell LPG for a full list of staions just check out www.mylpg.eu. Fuel is around 1.10€ a litre and LPG is around 0.66€ a litre. There are some large chains in Hungary, as with other Eastern European countries Lidl has lots or stores and there are also Tesco and Penny market. We used the first two and found them both to be very well stocked and food is reasonably cheap here. We spent around 70€ on a shop, but this didn’t include any booze! We only wild camped one night in Hungary when we couldn’t get into a campsite as it was full, but there were no problems in doing so. The campsites we stayed on varied in price but the most expensive in Budapest was only 18€ a night when you stayed for 4 nights, not bad at all when you think what you pay in other places in August! Although we didn’t wild camp anywhere near as much as in other countries there were lots of opportunities to fill up with water either at fuel stations or at water pumps on roadsides. Campsites generally had grey emptying points here. We did stay on one site that unfortunately used the same hose for both filling the tank and washing out the toilet cassette – YUK! We found the language very difficult to grasp as it has almost no relation to any other language so sounds totally unfamiliar. Although English is spoken widely in Budapest most Hungarians 2nd language is German, which for us didn’t help. Still good old google translate became our best friend once again and helped us in several situations. 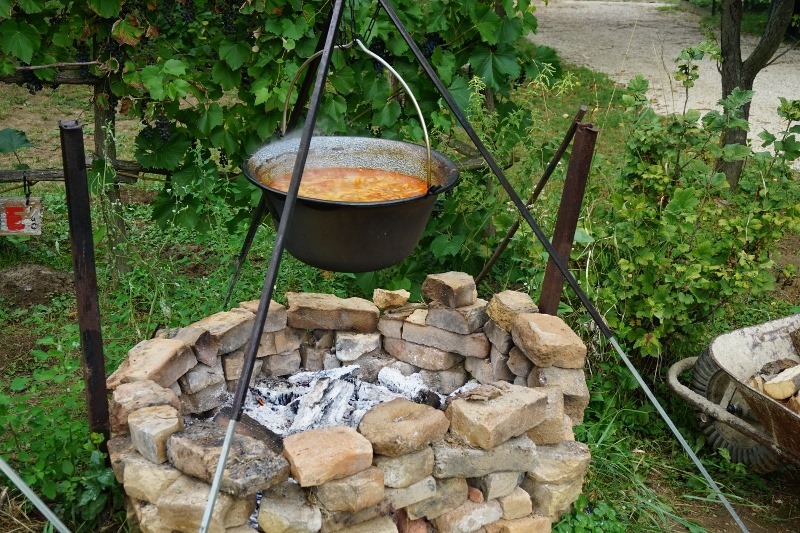 We only ate out twice in Hungary and both times tried the Goulash. The local food is very affordable and portions are very large. If you dare try the Palinka a locally brewed alcohol from fruit – the smell was enough to put me off! There are plenty of big bins around which seem to be emptied regularly. Wifi is widely available in bars, restaurants and campsites.As with anywhere 3G signal can also be hit and miss in more rural areas so if you’re reliant on wifi then you should aim for larger towns and villages.